Bacon-lovers in Toronto will be lacing up their runners and jumping on their bikes to earn themselves a 30% discount from Rashers, a bacon-only sandwich shop. The restaurant’s new promotion ‘Run the Pig’ is out to reach runners and cyclists when they are at their hungriest – right after exercising. 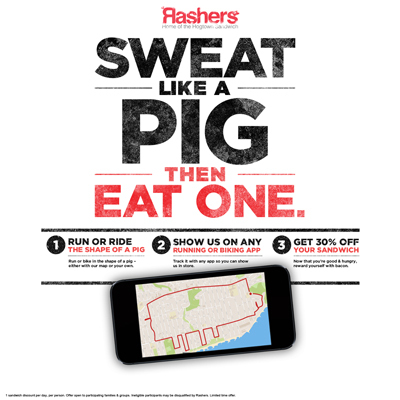 To earn their bacon, people are asked to use a mobile-app (such as Nike+ Running) to track their run or ride around a pig-shaped course of their own creation, ending at Rashers restaurant at 948 Queen Street East. The restaurant is also using their Twitter profile @rashers to tempt bacon-starved Toronto-area runners who have shared their completed Nike+ Running status. 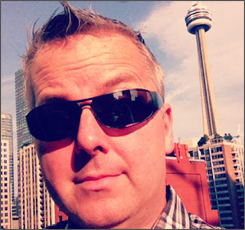 The campaign was created by the bacon-loving folks at OgilvyOne in Toronto. Before 2001, Krispy Kreme donuts were a much sought after contraband in this area. We would seek out the glowing ‘Hot Now’ lights at locations in the Buffalo area before arriving back home with a fresh supply of the soft, warm sugar-glazed treasures for ourselves and closest friends. Eventually Krispy Kreme would open several locations in Canada before dwindling to just the 4 that are left in Ontario and Quebec. 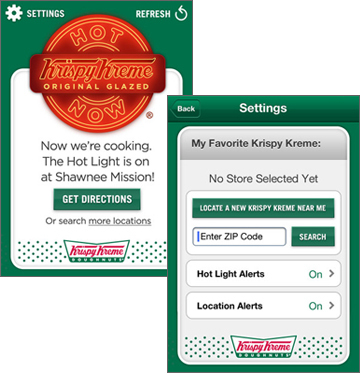 Now with the ‘Hot Light’ mobile users can receive alerts when a nearby Krispy Kreme location has the a fresh supply of donuts. After learning that nearly 30 per cent of its web site and social media traffic was coming in by smartphones they worked with their ad agency Barkley to create the app. Users can search for nearby active Hot Lights or choose when and how often they’d like to get alert notifications. The app can be downloaded in the iPhone app store or the Android Marketplace. Note: the app only works with participating U.S. locations.